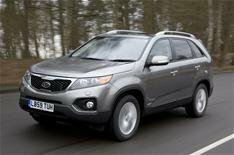 Kia issues Soul and Sorento recall | What Car? Kia is recalling more than 500 of its Sorento and Soul models because of a potential problem with the wiring in their doors. In models that have 'mood-lighting', Kia says there is a small danger of the wiring overheating, which could cause a fire. Kia is recalling 73 Souls and 476 Sorentos, and it says the work to fix the problem should take no more than an hour. Hamish McCowan, after-sales and logistics director at Kia Motors (UK) Ltd, said: 'We are not aware of any vehicles in the UK suffering from this problem, but we believe it is better to be safe, and that is why we are taking this recall action. 'The risk of a fire is small and would only occur under extreme circumstances, but we want to make sure none of our customers are anxious about the safety of their vehicles'. The recall affects vehicles built between September 2009 and June this year.